What is the Speedy Rewards Mastercard®? The Speedy Rewards Masterc​ard® is a credit card and your Speedy Rewards card all in one! No need to carry two cards. You will earn 50 Speedy Rewards points per dollar by using the card for purchases at Speedway locations and 10 points per dollar everywhere else when you use your credit card. These points are in addition to the Speedy Rewards points you may earn today through the Speedy Rewards Program. You can also earn 25,000 bonus points when you spend at least $500 within the first 3 billing cycles after your credit card account is opened. How do I apply for the Speedy Rewards Mastercard®? Go to www.speedyrewardsmc.com to apply online or complete a paper application available at any Speedway location. How can I earn additional points using my Speedy Rewards Mastercard®? When you shop at any Speedway location and use your Speedy Rewards Mastercard® for purchases, you will receive 50 additional Speedy Rewards points for every $1 spent. These points are in addition to the base, bonus, and club points you earn automatically through the Speedy Rewards Program. You’ll also receive 10 points for every $1 spent everywhere else Mastercard is accepted when using your Speedy Rewards Mastercard®. Speedy Rewards points earned at Speedway locations will be automatically added to your Speedy Rewards account at the time of purchase. Points earned using your Speedy Rewards Masterc​ard® at other locations will be reported to the Speedy Rewards program at the end of each billing cycle. New Speedy Rewards Mastercard® customers are eligible to receive 25,000 bonus Speedy Rewards points after spending at least $500 within the first three billing cycles. How can I merge my old Speedy Rewards card with my new Speedy Rewards Mastercard®? Your new Speedy Rewards Mastercard® account comes with a new Speedy Rewards number. 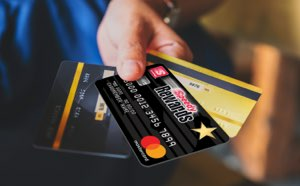 When you receive your new Speedy Rewards Mastercard®, you can go to www.firstbank​card.com/speedway and log into your credit card account. There is an option to merge your current Speedy Rewards account with your new Speedy Rewards number. You can also get assistance with merging accounts from Speedway Customer Service at 1-800-643-1948 Monday through Friday between 7:00am and 8:00pm EST and Saturday 8:00am and 12:00pm EST. Please note: in order to merge accounts, your existing Speedy Rewards card must be registered. Once the merge is complete, your previous Speedy Rewards card will be deactivated and your S​peedy Rewards Masterc​ard® will be the only card you need. How can I keep track of the points I have earned using my Speedy Rewards Mastercard®? The Speedy Rewards points you earn at Speedway locations using your Speedy Rewards Masterc​ard® will be shown on your receipt and automatically added to your Speedy Rewards account at the time of purchase. The points you earn using your Speedy Rewards Mastercard® outside of Speedway locations will be cle​arly shown on your monthly credit card statement and automatically reported to your Speedy Rewards account at the end of each billing cycle. 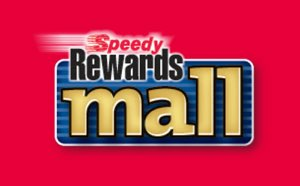 Your Speedy Rewards account activity can be viewed at www.SpeedyRewards.com. How do I redeem my Speedy Rewards Mastercard® points? Go to www.SpeedyRewards.com and click on "Login / Sign Up". Input your Speedy Rewards card number which is located on the back of your credit card underneath the barcode and begins with 499. You will also need to fill in all other required fields. Once complete, your card will then be registered and you will have access to redeem points in addition to all other member functions. Visit any Speedway location and scan the barcode on the back of your Speedy Rewards Mastercard® at the Speedy Rewards terminal. Press the blue “Register Card” button and use the virtual keypad to fill in the blanks with the required information. Your personal profile will be updated automatically with the information you have entered. Speedy Rewards points earned by using your Speedy Rewards Mastercard® inside Speedway locations will be automatically added to your Speedy Rewards account at the time of purchase. Points earned during the month when you use your card everywhere else are not available for redemption until they are posted on your monthly billing statement and then automatically reported to the Speedy Rewards Program at the end of each billing cycle. To redeem your Speedy Rewards points, simply scan the barcode on the back of your Speedy Rewards Masterc​ard® at any Speedy Rewards terminal inside a Speedway store or login to the Speedway mobile app. You can view your current point balance, point history, and your options for redemption. Are there any restrictions on earning Speedy Rewards Mastercard® points? Points are not earned on annual fees, finance charges and other fees or charges posted to your credit card account, cash advances (including but not limited to cash received over the amount of transactions charged to your card account, purchases of money orders or other cash equivalents), special check transactions, balance transfers, charges for other products, services or benefits provided, or other transactions determined not to be eligible. Points may be deducted from any returns, credits (for returned merchandise or otherwise) and disputed billing items. Points will not accrue and cannot be redeemed if the account is not open and in good standing. Who can I contact with questions about my Speedy Rewards Mastercard® account? First Bankcard®, a division of First National Bank of Omaha, is the issuing bank for your credit card account. The customer service phone number for the Speedy Rewards Masterc​ard® is 1-888-295-5540. Representatives are on hand to assist you 24 hours/day, 7 days/week. Online assistance can be found at www.firstbankcard.com/speedway. What happens to my Speedy Rewards account if I want to close my Mastercard® account? If you decide to close your Speedy Rewards MasterCard® credit card account, you will need to obtain a new Speedy Rewards card at any Speedway location. 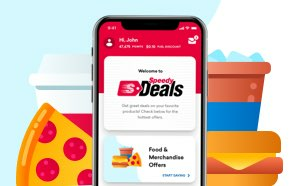 You can then call Speedway Customer Service at 1-800-643-1948 Monday through Friday between 7:00am​ and 8:00pm EST and Saturday between 8:00am and 12:00pm EST to have your Speedy Rewards points transferred to the new account. What happens if I lose my Speedy Rewards Mastercard®? If you need to report your card as lost or stolen, please contact First Bankcard at 1-800-444-6938. Can I still use my Speedy Rewards account even if I don’t want to pay with my credit card? Yes! Your Speedy Rewards Mastercard® has a barcode located on the back of the card which you can scan and still earn points through the Speedy R​ewards Program even if you don’t pay with the credit card. If you are at the pump, you have two options. When you swipe your Speedy Rewards Masterc​ard®, the dispenser screen will ask you if you want to use the credit card for payment. Select “no” if you want to use a method of payment other than the credit card. Your Speedy Rewards account will still earn 10 points per gallon even if you choose to use another method of payment. The other option is to enter your Speedy Rewards alternate ID.